Photo is indicative only. It is a collage illustrating the various features in the cedar shed range. It may not fit all models. Assembly System: The shed is made up of individual sectional pre-assembled panels that are joined during installation to make up the walls. Quick & easy. Doors: Two reinforced full height hinged doors opening outwards. Roof Line: Skillion roof - Highest point at rear & sloping forward towards the front. Roof Finishes Available: All roofs are supplied as standard in Colorbond: Woodland Grey. Additional colours (as listed) are available as optional extra additions. Wall Finishes: Western red cedar sheds are supplied in a raw state. They are not stained or painted - allowing you to apply the finish of choice or leave raw. Sustainability: Cedar is grown and harvested through environmentally responsible & sustainable planting and re-forestation practices. Flooring: The cedar sheds are not supplied with a floor. They can be fixed to an existing concrete slab or paved area. Optional standard & heavy duty timber floors are available for purchase if required. Concrete Slab: Recommended minimum concrete slab dimensions are the external base measurements of this product + 100mm in each direction. These are made to provide a platform onto which your shed can be secured to. They are made to lay directly on to a flat & level ground. These floors are rebated i.e. they provide a raised decking section inside the shed. The walls extend past the internal decking & sit on the floor frame at a lower level. This assists in minimising weather penetration from under the walls. Made of treated pine building materials. 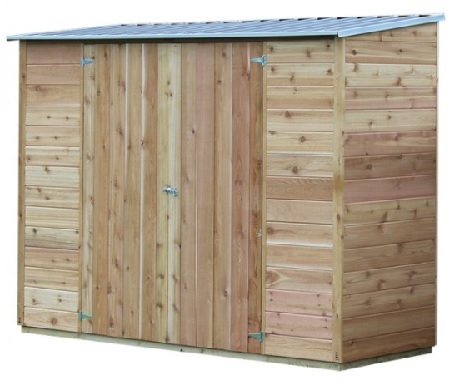 These are made to provide a platform onto which your shed can be secured to. The heavy duty floor option allows (where required) for the floor to be elevated with the use of posts. Ideal for slopes or damp areas. Larger floor joists are used to accommodate elevated loads – Top decking boards are the same as those used on the standard floor. Stilla timber products are made, held, dispatched and shipped – by the manufacturer in Brisbane. Standard Timber Flooring Kit - Acacia: S3106 x1 +$172A standard rebated timber floor is made to suit this model & has a rebated (or raised) decking section inside the shed. The walls extend past the internal decking & sit on the floor frame at a lower level. This assists in minimising weather penetration from under the walls. Made of treated pine building materials. Made to sit directly onto flat & level ground. Heavy Duty Timber Flooring Kit - Acacia: S3107 x1 +$300The heavy duty floor option allows (where required) for the floor to be elevated with the use of posts (NOT included). Ideal for sloping or damp areas. Larger floor joists are used to accommodate elevated loads - Top decking boards are the same as those used on the standard floor. Optional Cedar Shed Roof Colour: Classic Cream x1 +$70Standard roof colour is Colorbond Woodland Grey (No additional cost). Other available optional colours are as shown for an additional amount. Optional Cedar Shed Roof Colour: Cottage Green x1 +$70Standard roof colour is Colorbond Woodland Grey (No additional cost). Other available optional colours are as shown for an additional amount. Optional Cedar Shed Roof Colour: Deep Ocean x1 +$70Standard roof colour is Colorbond Woodland Grey (No additional cost). Other available optional colours are as shown for an additional amount. Optional Cedar Shed Roof Colour: Pale Eucalypt x1 +$70Standard roof colour is Colorbond Woodland Grey (No additional cost). Other available optional colours are as shown for an additional amount. Optional Cedar Shed Roof Colour: Paperbark x1 +$70Standard roof colour is Colorbond Woodland Grey (No additional cost). Other available optional colours are as shown for an additional amount. Optional Cedar Shed Roof Colour: Surfmist (White) x1 +$70Standard roof colour is Colorbond Woodland Grey (No additional cost). Other available optional colours are as shown for an additional amount. Optional Cedar Shed Roof Finish: Zinclaume (Galavanised Silver) x1 +$70Standard roof colour is Colorbond Woodland Grey (No additional cost). This option is for a Zinclaume finish (galvanised silver) for an additional amount.